It’s time for a zombie film that manages to make an already weak genre even weaker. This one takes everything you don’t like about zombie films and doesn’t even bring in any of the positives. At the very least, Resident Evil had some nice action scenes once in a while and a good soundtrack to boot. It was an interesting film even if it was a bad one and kept your attention from start to finish. Maggie never gets interesting and is so focused on being emotional that it forgets to actually do anything. There’s no subtlety to this film and while it’s hitting you over the head with how sad the film is, you’re waiting for the zombie apocalypse to start. So the film is about a man named Wade and his daughter Maggie. She has been bitten by a zombie and is doomed to become one of them. The process is randomized so nobody knows when she will turn, but Wade is encouraged to destroy her or take her to a facility where she will be canabalized. See what I mean about the lack of subtlety? The film could at least give him a decent option as opposed to dark and gritty for everything. So what will Wade choose? This film is just a cluster of nonsense from start to finish with forced drama at every turn. Let’s look at the obvious here. Once you are a zombie you are taken to a place to get eaten alive by zombies. Why? What purpose does such a place realistically serve? I get that this is a dystopia but why not just a quick death if they’re going to bump these guys anyway? Are there no more poison pills in the future? Why bother with a tonic that will torture you for hours before you finally die when you can swallow a little poison. If that doesn’t work then I’d like the film to address this. The film also adds in animal violence for no real reason. It just comes out of nowhere and tries to be as violent as can be. The film was already garbage before this scene but it certainly didn’t help matters. I don’t use the term lightly but for a 0 Star film like this one it’s only fitting. It’s basically the tv version of The Walking Dead and the atmosphere and writing are like Attack on Titan, only worse somehow. While the movie is beating you over the head with a stick as it tells you to feel bad for the characters, it also keeps reminding you that they’re not even thinking about the consequences. For example, Wade doesn’t have any safe guards for when Maggie turns. He says he does, but he clearly doesn’t since he leaves her unsupervised for ages. I’m cool with him wanting to save Maggie because yes that is the right call. Still, you need to at least build some kind of large cage around the premise or something to make sure she can’t escape and destroy everyone. Instead he makes everyone feel uncomfortable about the situation. Although in a world where all of the kids hang out without suits and keep on infecting each other, it’s certainly a matter of time before humanity is wiped out. Wade is a reasonable character since he at least didn’t destroy Maggie. That would have been another big facepalm moment had that happened. He stayed strong and confronted everyone who tried to put her down. You do question why he would still risk leaving home for hours at a time to work in the tractor since he could walk home to an empty house but I guess he figured Maggie could stay strong and fight the virus. He was wrong. 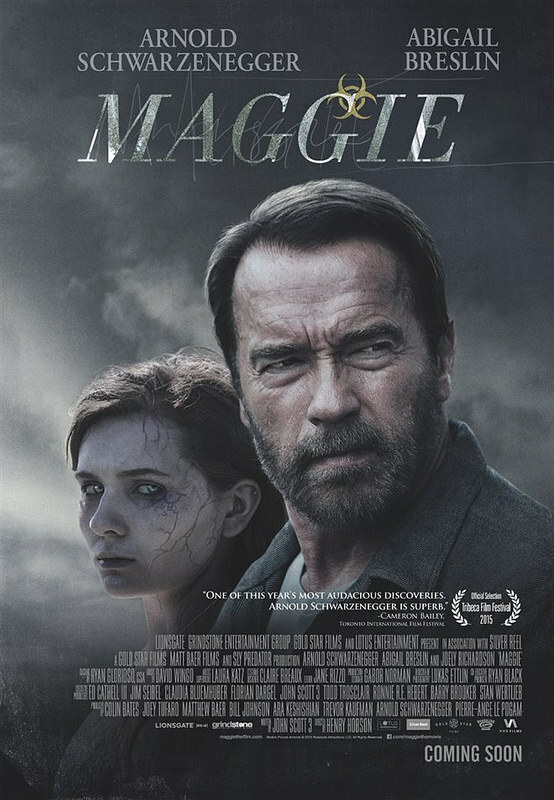 Maggie does last for a while, but from the start you know that she is doomed. This is just that kind of movie, one where there is no hope from the start and a sad ending is guaranteed. It could have been even more grim I admit so I’ll give the film some kudos there. Not much though since it’s not like the film could have gotten a worse score at this point right? She gets a really random subplot with some annoying teenagers which was fairly forced and didn’t add to anything. We learn more about how evil society is and how the kids have no options so I guess the film just wanted to remind us of how grim the world is. We are reminded so often that it makes you wonder what the purpose of the film is again. Is it an emotional story about letting go or a director’s true vision on how the world is? Ultimately the teenagers are only introduced so we can see one of them dragged off in tears to the boot camp where he will suffer a lot before dying. The edge levels are still high so I’m sure the film makers were particularly pleased with this moment. I can imagine them singing the Infinite song from Sonic Forces while making this film as it would fit the tone pretty well. Although I’ll take the song over this movie any day. Aside from all this negativity let’s look at the world in general. The cops and authorities certainly aren’t doing a very good job of preventing the outbreaks. They don’t know what’s causing them and can’t cure it. They don’t even have a way of knowing where these zombies are so now we live in a world where they can be around any corner. Based on how everyone acts in this film they should all be turned already since it is supposedly contagious. The world seems semi ruined already in some parts while quite civilized in others so maybe the virus is just spreading really slowly? At any rate my money’s on the zombies to win in the long run. Overall, This is definitely a very dark and gritty film. It’s quite mean spirited and does all it can to show you there is no way out of the situation. There is no big climax or moment where the heroes think they have a chance. It’s a film that starts at the bottom and is content to stay there for the duration. The colors are very dreary and dark so there isn’t anything good to even look at. I like to think this film was simply made in a dare to see if anyone would actually watch this movie. The only thing it did right was to further convince me that zombie films are going to almost always simply be a waste of time. This entry was posted in Live Action Movie Reviews, Live Action Movies, Reviews and tagged Film Review, Horror, Movie Review, Review, Thriller, Zombies by dreager1. Bookmark the permalink. Arnie’s glory days are truly over. I’m not interested in watching yet another zombie film and the animal violence is a real turn off. Definitely, he had a good run, but it’s time to just get out of the business at this point. The animal violence is certainly a film breaker.